I am going to enjoy the whines, wails, rants & raves of the surviving debris that are basically marching & protesting for the sake of evil. 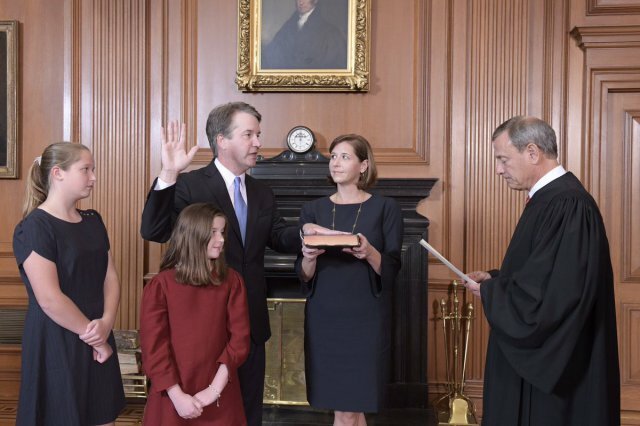 There's a legendary character in British lore: Sydney Bartholomew Reginald David Vivor – who was knighted (title “Sir”) - and he declares Brett Kavanuagh to be innocent of the charges leveled against him by the whore . . .
. . . and I believe Sir Vivor! I'm going to float a rumor and, since this is my favorite site, it's fitting that it starts here. Hired to take out Kavanaugh. Was she really that pathetic a hired gun, or did she miss on purpose? If you took the time during the hearings to notice - and I did - she chose not to surround herself with friends and family. Instead she surrounded herself with a dream team of extremist alt-leftists - all feverishly committed to the proposition that the only good Republican is a destroyed Republican. She shot her quiver of arrows, but every shot missed, hitting her confederates instead of her quarry. Could she have done so on purpose? I see it as her family wanted no part of it or her. Is so much winning on a single Saturday afternoon legal? I was at the swap meet while they were voting. I actually stopped and watched the vote on my phone and then cheered the results. It made the day all that much the better! My opinion is she looked and sounded pathetic -- too much so, really -- but it was the dream-team plan that sucked. With today's not-your-grandfather's-media, i.e. the alt-media, they couldn't sell the idea that the only "facts" Ford has are who (Kav) and that she "had only one beer". The chans dug out some of the rest of the truth of it, the information began to spread and it became obvious the Left did what the Left always does: they over-reached. It's become obvious to me that the more batsht fcking unsane the Left behaves, the worse and the more they lie. Time to flush the blue wave down...for good. But the news when received was welcome and thankful. Now, I cannot wait for that Ginsberg seat to open up! I did watch the vote and two things surprised me. #1 they went in alphabetical order. #2 they didn't post the vote tally as they were voting. Oh a third one is that Ford loving Wallace hosted the show. Democrats everywhere are chagrined that the Whoremoan therapy to which they subjected Kavanaugh did not work. And now they will toss Ford like used toilet paper. Kavanagh just hired all women law clerks, one black for SCOTUS. RGB has hired one black clerk in her entire tenure. 36 seconds. Unbelievable. Hillary about civility. All women -- to prove a point? I wouldn't have advised him to have done that, rather all men subordinates, all the time. They seem to learn nothing. I think his point may be that the dems don't scare him and he's not changing for them. I wouldn't trust one single woman on his staff to not be a plant waiting to holler 'harassment', is what I'm saying. My understanding is that the women he hired were all women he worked with before, and who supported him during the sham. As a troll of the left 10 out of 10 for style. But yeah, most men are looking at that sh*t-show and saying - "um, lets hire as few women as we can get away with"
"The Democrats used to be the party of the working man, now they are the party of the shrieking woman"
Judge Kavanaugh had selected and interviewed all the clerks he hired before the Senate hearings. He was prepared well before the sh!t show started. normally serve for about a year.